This topic will address various aspects of the Glen-L Double Eagle built in aluminum. This 23 to 26' design is little bit unique for the AAB Forum since the boat has an inboard engine and a shaft instead of the more common outboard drive system. However, since I've been in several discussions on other forums about this boat, I've decided to put my posts here and offer the builders to come here to see my remarks and illustrations. I'd prefer to collect my ideas, remarks and images here so AAB's overall collection of Aluminum Alloy Boats is increased, but I do realize the outboard skiff is the 90% preferred model. That doesn't mean that those skippers may not enjoy reading about the other types of boats and their features since we're still talking AAB's. This design is different in two major features of the Lines Plan; first, the keel is not parallel to the chine in Profile View (as near as I understand as I have not seen the Lines Plan in person); and second, therefore the forefoot is deeper than the after centerline of the bottom plates. 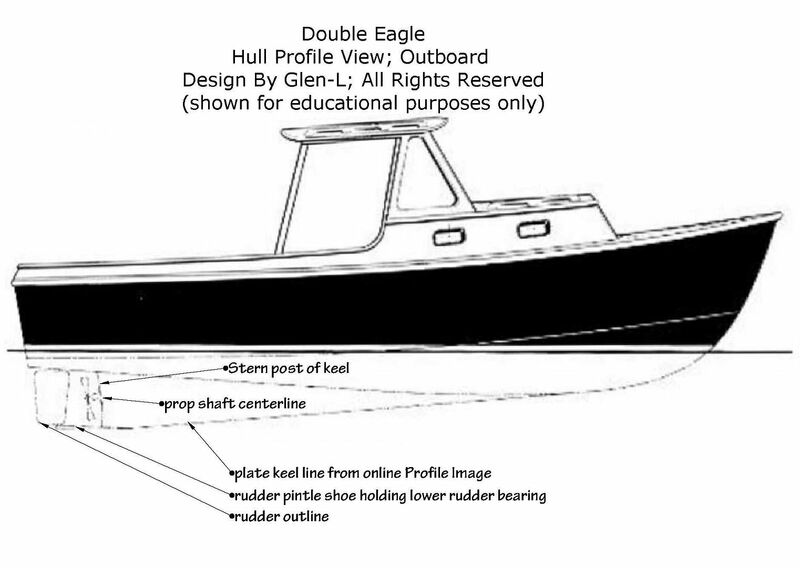 Here is an online snap shot from the Glen-L site which sells the plans for this small version of a "down East" lobster boat. Here the underwater shape is dotted in and the overall look of this class of boat is shown. The full length keel is common on boats that will travel offshore at moderate speeds and return in a following sea- the full length keel is about the best to keep the stern from 'slewing' sides trying to overtake the bow's deeper and sharper forefoot buried in the next swell face. Also this boat has a different performance feel due to the green block in the next image. I've roughly approximated the hull in a 3D model for the discussions I've mentioned above (those discussions are being moved here to AAB) but its important to see clearly that I've simply guessed at the real lines, this is not a accurate model, its an sketched approximation. I'm not attempting to take either Mr Glen Witt's or Mr Ken Hakenson's lines or work and I do not sell plans or claim credit for this boat's design. The boat is not designed for outboard speeds or at least not the top end of those speeds, HOWEVER she is designed to give a motion that is somewhat different than an outboard. Outboard skiffs have a huge mass on the stern and move both at rest and underway with respect to that huge proportion of their all up displacement behind the transom. An inboard with a shaft has a different motion due to 'green box' that is the engine in the CB or center of buoyancy - middle of the boat. This arrangement can not ever go as fast as the same power on or behind the stern - just simple physics. But it moves differently especially in heave, and if pushed to very high speeds (>28mph) I think the deep forefoot will ride up and she will pitch up by the bow to an unusually high running angle. But that is just my opinion of the lines, perhaps the forefoot's sharper entry will compromise the lift of the deeper forefoot? At any rate she should run into a head sea at 18-25 knots smoothly and remain relatively dry given she doesn't appear to have a reverse chine (? ), and do the same with her stern to the waves when on those headings. So.....(what?) this topic will explore some of the aspects of a boat of this type and this particular design from the fine Glen-L (Witt) catalog of marine designs and plans; and continue (I hope) to be an expanding resource for welded aluminum boats of all types. If you were to search on this design you'll find she's been built in metal and dead plants, and the hull seems well received and reliable. Now for a few details? All boats, even jet pump driven boats have some form of propeller- something to propel the boat by moving water away from the boat. Each of the types of propeller has some type of drive shaft to couple it to a marine reduction gear or directly to the engine’s flywheel and crankshaft output. This is of course how the engine’s torque is transmitted to the propeller to move the boat. Inboard boats like Double Eagle have a long shaft that reaches from the after end of the engine at a downward angle, through the hull in a specially installed tube or pipe, to the propeller just under the stern. An outboard engine’s prop shaft is only a few inches long maybe a foot total in a higher horsepower engine. All shafts have bearings to support the shaft and to keep it in a line while turning at high speeds. Outboards and inboard outboards have all the bearings, shaft and reverse gear in one small streamlined housing that is underwater, but sealed and filled with oil. That is a great design and solves lots of problems for a boat builder, since lining up the shafts and the bearings, is done in a machine shop setting, the bearings are lubricated with oil and all of the stresses are in a small volume so they’re not stretched out for 10’ or something like they are in a shaft driven inboard design boat. Inboard shaft boats have shaft bearings too, but they’re lubricated with water. In fact the bearing are not only lubricated by water instead of oil, they’re formed of water too. Inboard shaft driven boats have shafts which are much more slender in comparison to nice short outboard or inboard outboard drives. The thicker a shaft is in proportion to its length the stiffer it will remain in use. So an outboard lower end drive shaft that is 12” long and ¾” in diameter has a ratio of about 0.06 while a 1-1/2” diameter shaft that is 6’ long has a ratio of 0.020less than a third of the ratio of a shaft ½ as large in diameter. 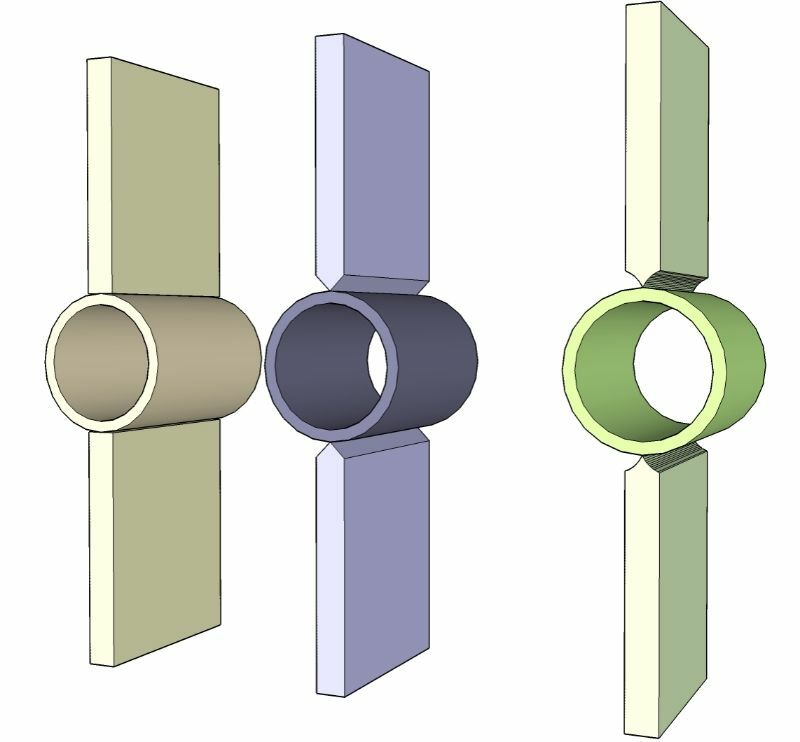 What this means is that inboard shafts have to be supported not only at both ends but sometimes, depending on the diameter to length they have to supported in the middle too. 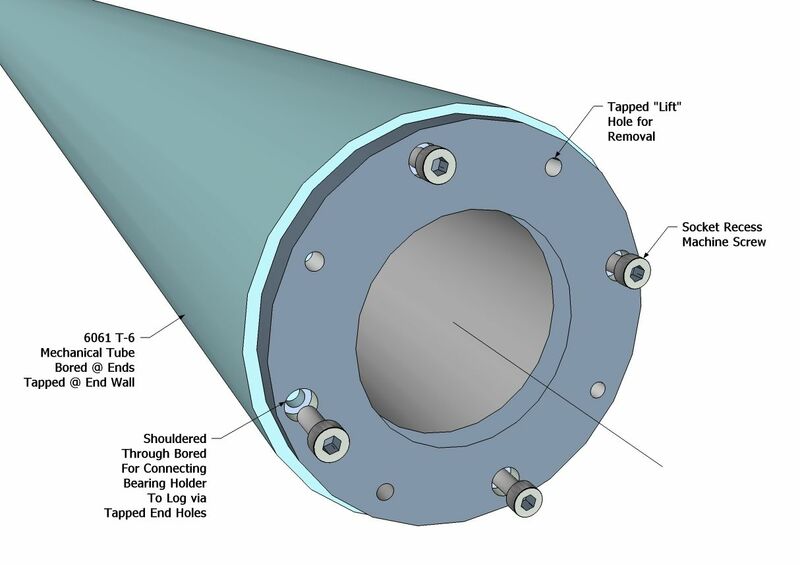 If we were considering the design of supports for an 8’ long shaft then planning and placing the bearings to keep the shaft in line means there will have to be a method to place at least three welded in “bearing holders”. That work is one of the main purposes of this series of posts about the Double Eagle. I built some 30’+ forward engine, inboard and shaft boats, of welded aluminum, that were originally designed by Ed Monk, in the late 1960’s, I believe. I’ll provide some rough sketches of the original plans, from an old and not too facile a memory, and then show some ideas about how to improve on those original plans. If you are interested in this type of information presented in a broader scope, please let me suggest that you consider Dave Gerr’s books http://www.gerrmarine.com/dave.html . Clearly the guru of boat design and building authors whose incredible knowledge is coupled with the ability to make the complex understandable. I think I have all his books, and have made them central to my gift giving for years to my family and boat building friends. I can’t recommend his work enough. Our discussion is about a design and building method from the boat builder’s point of view so it is more detailed- but for a very much more limited group of readers. I will not try to rework any of the http://www.amazon.com/boat-mechanical-s ... pd_sim_b_2 details here. This book should be on the book shelf of all builders in my opinion, so what I will attempt to do is stand on this information, then build a few ideas that are results of my welded aluminum experience as they apply to the Double Eagle. Cutlass bearings versus ball bearings or roller bearings, need to be mentioned so we can introduce the idea of tolerance and shaft alignment. Outboards have sealed oil fill chambers to hold he shaft bearings and these roller or ball bearings are mechanically superior to water cutlass bearings; the oil lubricated metal bearings last longer, work at higher speeds more reliably and are easier to plan for and install partly because the tolerances or clearance between the parts is much smaller than in a water cutlass bearing used to align longer inboard engine shaft driven boats. A ball, thrust cone, or needle roller bearing relies on metal spheres, cones or cylinders rolling on (touching) precision machined cylinders, “half pipes” and cones all bathed in oils that reduce friction and allow the metals to touch without disintegrating. Metal to metal bearings incorporate harder material than water so they have much smaller surface areas able to hold bigger loads than water can hold. Marine cutlass bearings are larger in area to allow a turning shaft to be supported in the bearing by a layer of water that is ‘hardened’ by the extreme speed of the surface of the shaft moving the water inside the tolerance of the bearing sleeve to shaft cylinder. Lets recall a Mythbusters episode where they fired a Barrett 50 rifle into a swimming pool and the bullet didn’t penetrate at all, instead it disintegrated almost at the surface of the water. What this illustrates, and I’d like to point out here, is that if any water is impacted at super high speeds “water is harder” than at low speeds. The circumference of a 1.5” diameter prop shaft is (pi * D = 3.14159*1.5”=4.7” around. If the shaft is rotating at 300 rpm for example, that is 300 * 4.7” = 1,410”/min= 117 feet per minute. That’s enough to get water resistance up- ‘hardening the water’= because the surface speed is fast and at 600 rpm the speed of the shaft’s surface impact on water is 235 ft/min. What happens inside a cutlass (popular misspelling of the original cutless) bearing is; as the shaft speed increases the water forms a fairly uniform hardening sleeve that actually keeps the shaft from touching the bearing liner, and centers the shaft in the bearing’s bore. What happens if the bearing bore is 2” and the shaft is 1-1/2”? Nothing. The tolerance of shaft OD to bearing ID has to be close. http://www.deepblueyachtsupply.com/mari ... s-bearings here the tolerances can be explored and the many types of products reviewed. http://www.naval-technology.com/contrac ... s/duramax/ Also a good read on the same material. So where are we? Water lubricated bearings work by ‘hydroplaning’ the shaft inside a sleeve that allows water free access to the shaft sides as they spin in a close fitting cylinder around the marine prop shaft. The shaft’s surface speed induces a high resistance to movement by the water forming a ‘hard water’ cushion around the turning shaft, so that metal shaft can turn with little or no wear on the shaft AND the bearing liner. This is why he name is cut-less. A water film generally does not cut the bearing or the shaft. To begin looking closer at the keel of the Double Eagle, I'll post some images to introduce terms and locations of the parts. Here's the online profile View with some of the parts or lines labeled so we can look at them in 3D and discuss how they will affect the boat or how they could potentially be built with different ideas. The bottom most line is the bottom of a plate keel. A single plate keel, say 3/8" or 1/2" is pretty stiff and could work to make the external keel for this boat. But the shaft log or shaft tube will have to in the center of that plate so it stands to reason the builder will have cut the plate out the OD of the shaft log and re-weld the entire length of the log, top and bottom, port and starboard. This shaft angle may be off, maybe too steep (?) but it implies the shaft penetrates the hull where the centerline of the shaft meets the bottom intersection of the hull plates. Stripping away half the boat, not showing frames and showing an outline of the keel compared to the cut through the hull at the keel plane- in this pic. Same pieces or locations labeled to correlate these elements to the hull in Profile View. Here the hull is gone, the keel remains, and the same labels are used to get us all oriented to the same parts in the discussion. There is a 'tab' or strip of plate at the top of the keel, I've made it darker shaded, this would be fit up into the frames and between the bottom plates. The weld at the keel or 'rabbit line' would happen at the lower black line, not the upper, the upper line would be a VKB or vertical keel bar running between frames inside the boat at the centerline. The prop shaft would be inside a pipe that was centered on the shaft centerline, where the aft end must be low enough for the prop to clear the hull. The after end of this log or pipe would normally hold the after or stern bearing. In welded aluminum boats this bearing is most often rubber lined and plastic sheathed, so there is no or very little interaction with the shaft log where it is mounted. The upper end of the shaft log has to seal the water out of the bilge and this is done with either a stuffing box or 'dripless seal' or face seal as they are sometimes called. If the shaft were at a lower angle, the engine might be farther forward, so in 10' or longer shafts there is often a middle bearing about where the shaft comes through the hull. Next we'll need to get a closer look at the parts as they are probably originally designed. Kevin - Great illustrations and explanations thus far. Looking forward to your observations and recommendations! By the way - amazing work on your sculptures! Thanks Darrell, here are some background facts to add to the mix regarding plate keels. All aluminum welds heat up the parent metal until it melts. All aluminum welds require adding some filler or a welding alloy addition of more metal so when the metal cools; both the original and the added metals contract because they were combined when they were molten or expanded. Molten metal is as expanded as metal gets, so when the two combine in a weld then cool, they shrink. When we weld along one side of a plate or sheet that side will contract smaller than the original size because the added metal of the weld (with its filler) contracts more than the original metal expanded. If we take any given triangle and shrink one side… we’ll have to bow the opposite side or find some other means to account for the shrinkage. Triangles are structurally stable because their sides are fixed lengths, you can’t change on side without affecting the others, if the corners stay together. That means, in a single plate of aluminum, shaped in a triangle, like a keel plate, if you weld along one side, say at the keel to hull plate seams (?) those seams will contract a little and make that side a small amount shorter than any un-welded sides when compared to the original cold cut shape. If the welds were not uniform, say for example one side of the hull were welded with a different preheat? Or the shop was warmer when the inside weld of the keel seam to hull panel were partially welded before the outside were welded? That may preheat a single plate design keel, and the weld contraction may be less one one side and greater on the other. This means there is a side to side curvature to consider, as well, in a single plate keel design- because there may be welding distortions. 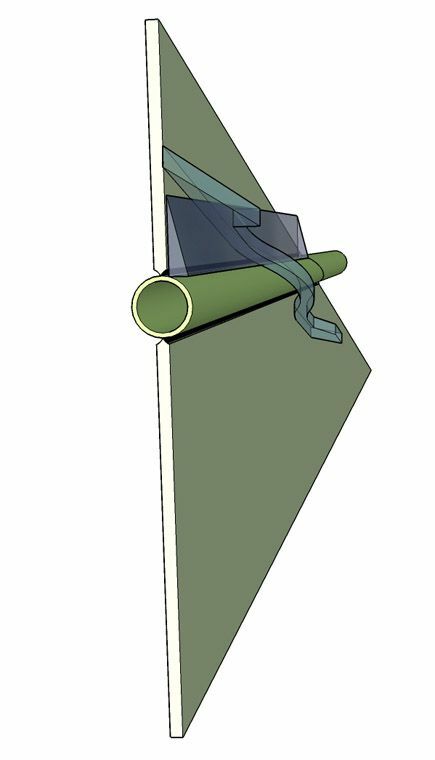 One of the common ‘cures’ or design remedies that was used in these types of flat plate keels was to put a horizontal bar, pipe or show along the lower edge of the triangular keel plate. This was welded to the lower edge resist side to side contractions/distortions, and to keep the triangular (Profile View) keel plate flat in both directions, vertically and longitudinally. So a single plate keel can be used, they do work, but they do require some good attention to weld sequence and perhaps some post welding straightening by pressing or other cold work. A "shoe" or bottom member could be attached, and I’ve seen designs from reputable firms that show a ¾” x 3” or 4” flat bar welded as a T fillet below the plate keel!!!! Think of the drag that hull experienced pushing or pulling a flat bar through the water at an incline to the waterline? What about the weld along the shaft tube? 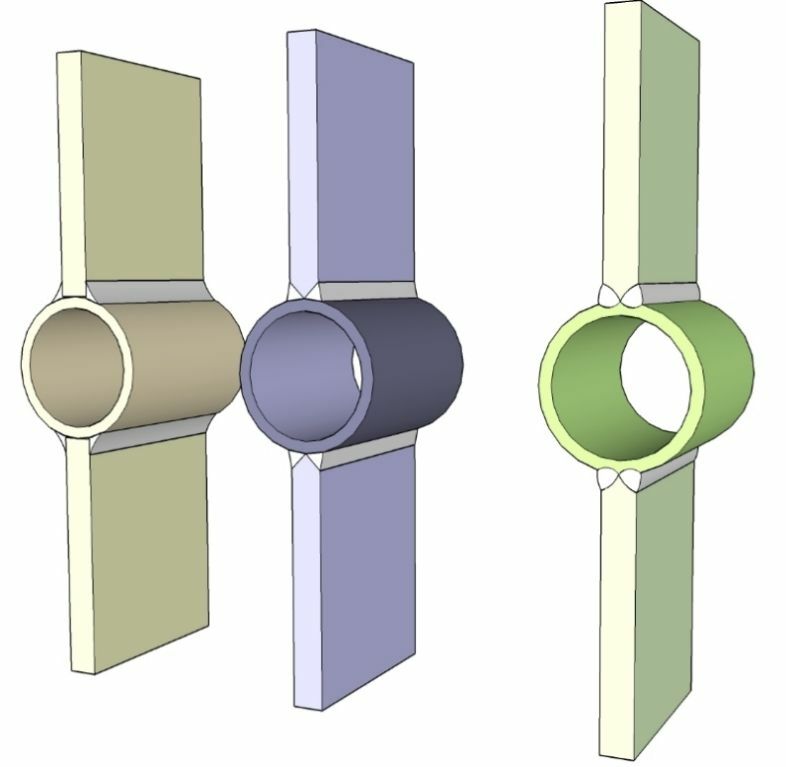 The pipe or tube used to house the prop and cut-less bearings have to be in the center of the single plate keel design. So… to install a shaft log; there are four full length (of that log/tube/pipe) welds. There is one top and bottom both sides of the plate and they leave a Heat Affected Zone on the tube as well as weld contraction consideration just like we considered above. If the boat needs a 20” propeller that implies a few inches of hull to tip clearance at the top of the prop and bottom of the keel seam of the lowest point of the hull above that prop. That means the center of the keel’s shaft line needs to be about 11 to 12” below the hull and the single plate keel about 2’ deep. Even a 3/8” plate can flex in 2’! I don’t mean that 3/8” plate is flexible like a piece of 1/8” sheet that is 24” long, but I mean that 3/8” plate is not rigid in that length. So the prop’s blades can vibrate the single sheet keel easier than the same prop’s side to side thrust can vibrate a 4” wide x 24” tall box beam. Cutless/cutlass bearings fit to the shaft, and are concentric cylinders so they may fit inside the stern tube, if the shaft log is well chosen for size and wall thickness; or as I advocate the shaft log should be machined to hold the bearings and shaft packing if a stuffing box is used or to create a bore aligned concentric land for the drip-less face seal. I'm not arguing a 3/8" plate will turn into a potato chip shape just because its welded heavily along one (rabbit line) edge. I'm just pointing out the fact that all that two sided, fairly long welding on a flat plate implies some good planning, lots of balance to the weld application and other details. The more welding is back to back matched the more distortion my result for uneven welds. When the single plate keel is done - what shape is the shaft tube in? Most extrusions are 6061-T6 and pipe comes in Schedules or percentages of the wall thickness as a function of diameter of the pipe. (I'm not sure if most readers know that standard wall is Sched. 40 so all the schedules above that have heavier walls and all the schedules below that have thinner walls, in proportion to the ID of the pipe?) What does happen and is a design problem using 6061-T6, even Schedule 80 wall pipe is: the pipe can crack along the HAZ due to the extensive welds and it's roll as the single plate keel's 'seam'. I don't use pipe and suggest that mechanical tube be used which is extra heavy wall material. I don't weld the shaft log/bearing holder along the length as part of the plate keel, but I have seen this done in numerous boats. I weld the two ends into the hollow keel shapes and the hull penetration to allow the machined bearing holder to retain and alignment done on the lathe, and simply sealed and structurally attached to the hull and keel. Last edited by kmorin on Wed Apr 30, 2014 2:46 am, edited 1 time in total. 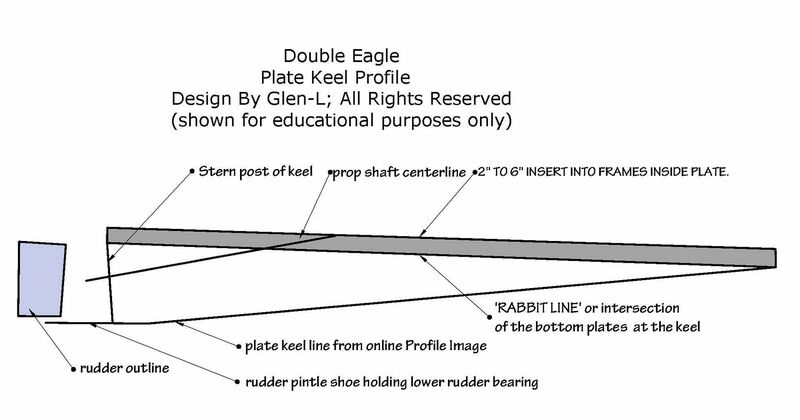 The original (Glen-L Double Eagle) design shows a plate keel, but since I don't know those details exactly, I'll put up some images of a few parts of the plate keel for consideration. I'm not trying to imply this method of building a welded metal boat's keel won't 'work' or service the boat's propulsion, just noting some of the problems I've seen building and repair various keels' structures over the years. First some keel sections where a 1/2" plate is welded to a sched. 40 pipe. Here are some joint prep cross sections and a discussion follows about each as well as some questions for the builder of this design keel. First, is- how do you line up the top and bottom pieces with an entire shaft log in between? I cut a series of flat straight edged plates that had an allowance for the log/pipe/tube and tack welded them to the upper and lower halves/pieces of the plate keel shown here as just two stubs above and below the shaft log/pipe/tube. In real life the two plates would not be equal in size vertically. 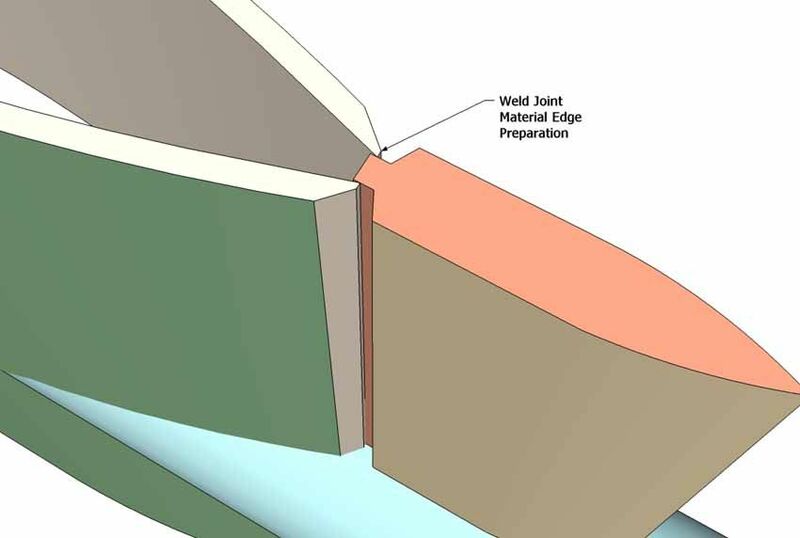 Each of three types of prep are welded in this image, and the reason to discuss this is the weld cross sections. Can the welds all be added with a uniform cross section? They an be done equally- but its not for the first time builder since the four positions are not the same. The left and right (port and starboard) sides result in different body positions and one of the top or bottom welds will likely be heavier than the other resulting in some distortion from welding. I'm not saying these welds can't be done, but I'm pointing out that the newer welder will have a challenge to make all four welds uniform in cross section, lengths, and tie-ins. 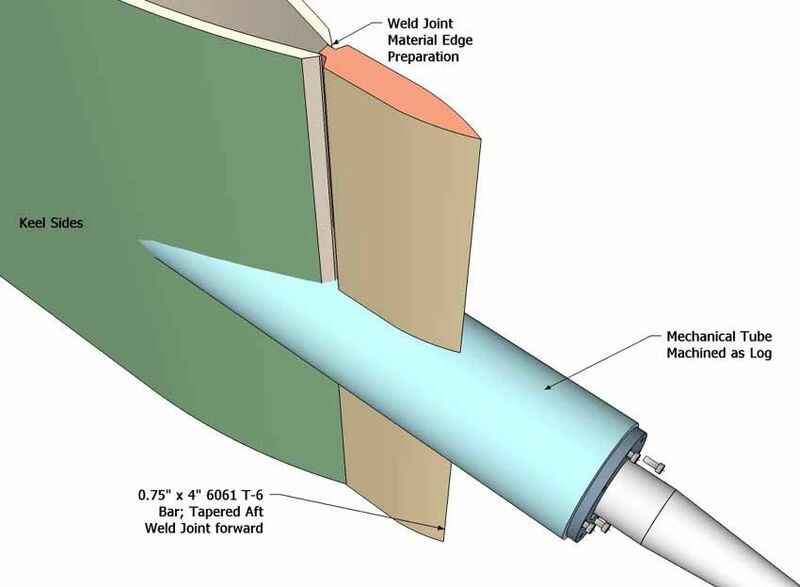 Aso, if the first method is used the weld is deposited wider and somewhat thinner so it has to be hotter and heavier to compensate for the lack of joint preparation. That often results in a greater cooling contraction and more distortion- bigger, wider welds, mean more molten metal to cool at one time. Putting in four welds in 3/8 or 1/2" plate to pipe is a difficult maneuver even for an experienced aluminum welder. Doing those weld without adding uneven contraction stress is possible but not easily done by a first time builder in my experience. The welds cross section, the sequence of the welding and the need to be continuous when the welds are complete, as well as the out of position welding implied by the split plate keel means this design element will challenge the first time builder's welding skills in a critical aspect of the boat's structural integrity. This image introduces another of my gripes about this type of keel design. The Heat Affected Zone is somewhat wide, and continuous along the pipe's wall. 6061-T6 is not all that friendly to side wall strength where its been welded lengthwise and the tabs 'bent'. What I mean by that is the stubs in our images here (all colored for clarity not a suggested paint scheme!) will be the upper and lower plates of the keel and they will have some flex and possible impact. What holds them together? The side wall of a tempered alloy that has been relieved of the heat treatment by welding. I'm not a big fan of this plan. I have repaired boats with shaft logs like this- split their length due to the vibration causing the log to fail along the edge/boundary of the HAZ. I'm not trying to imply or suggest this will happen in all cases, because I have not seen that failure. But, I am saying that since I have seen several log failures due to the huge HAZ top and bottom left from welding 1/2" or 3/8" plate (that takes some amperes) why risk building in a known potential problem? Can you weld well enough to single pass a series of four welds on 1/2" plate? If the answer is yes, then the design has less risk for your boat, but realistically if you haven't done hours of heavy plate will you practice or take the risk? These welds are kind of critical and perhaps there are other alternatives to this design, even staying within all the other specs for the Double Eagle. Further, what happens to the round pipe? It becomes "egged" or oval from the heat of contraction of the huge top and bottom welds? So not only does the plate welded to a log design end up reducing the log's wall strength exactly where that strength is most needed... the shape of the pipe is usually distorted so using the pipe as a log becomes a loss when you try to insert the cutless/cutlass bearing, if you're using the log to house these rubber lined water lubricated bearings? One of the ways to overcome this is to buy and install a heavier wall pipe, say sched 80 or even 120/160/XS or even XXS. 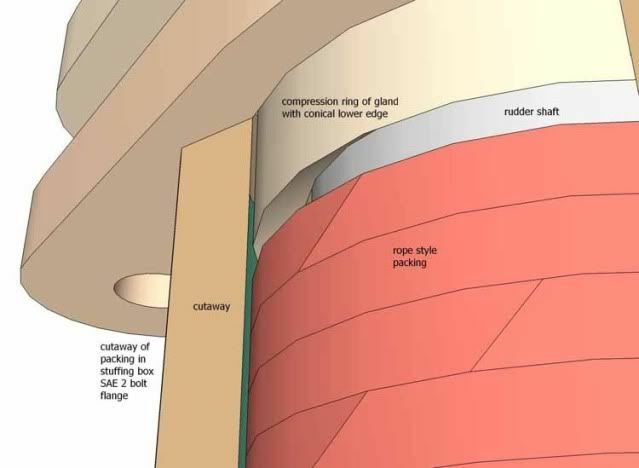 Each time the wall is thickened there is are two results; #1 the weld (probably preheated now) becomes higher wattage/power/amperage to melt the thicker material along with the keel plate & # 2 the weld becomes large in order to maintain the heat of fusion in that thicker material, so the potential for errors in balancing the stressing/contraction of cooling goes up. But the heavier wall shaft log will resist bending and distortion better so it would clearly be an improvement over a Sched. 40 pipe to use much heavier material and (just) learn to do the welds required so the plate type keel could be built with the least risk to its potential weaknesses. The weld edge prep in heavier plate becomes more and more critical since these welds usually have to be done single pass- first time is the charm- because building up larger and larger overlapping welds becomes counter productive is you've relieved all the post forming heat treatment in the plate or extrusions. Last edited by kmorin on Wed Apr 30, 2014 2:56 am, edited 1 time in total. Another reason to consider a streamlined shape as opposed to a welded plate keel is the flow around the shaft log's shape in the water, at the angle to the running waterline. 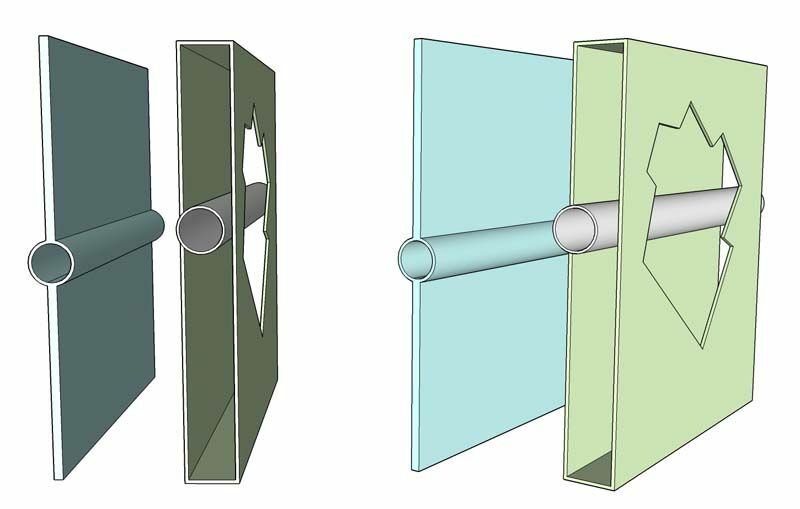 In this fanciful image, from aft and below an imaginary keel assembly; the plate keel has a pipe shaft log and a welded top and bottom plate. There is a translucent arrow showing the water flow around the tube in the water at the shaft angle. Also there is another translucent shaded region just behind the tube's top weld seam. 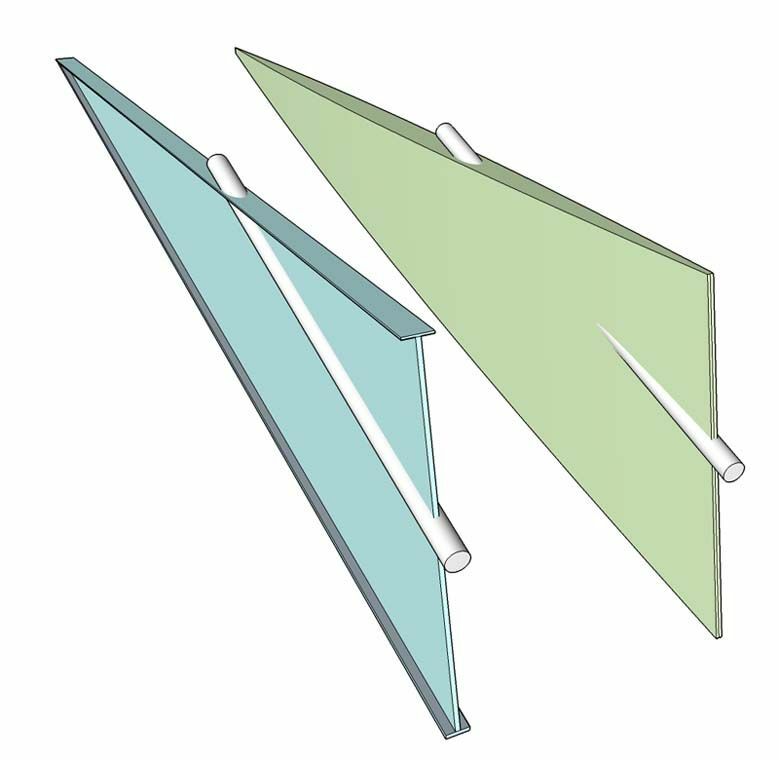 This Profile View is to help orient the three or four pieces of the drawing so the glass (water) arrow is a horizontal box and the area of some turbulence behind the pipe/above the log is a flat blueish rectangle while the keel plates and log are yellow (keel plates) and green (log/pipe/shaft tube). A last view from the top, looking down through the non-existent hull bottom plates, to see the flow arrow's symbolic representation of the water flowing around the tube that is being forced through the water at the shaft's angle, and therefore creating some disturbance along the back edge of the log/pipe/shaft tube. This shows that at least some drag is induced by the design and some of the top of the wheel is going to have potential for turbulent flow or at worst a source of partial cavitation due to bubbly, turbulent water. Will this design stop a boat, will it negate all power and travel, NO. What this shows is potential for less than clean flow to the wheel; due to the design of a welded single plate keel. How much difference will this make? It will make more drag and speed loss with greater angle of the shaft, larger size of the tube/pipe/log, and the higher speed of the boat. 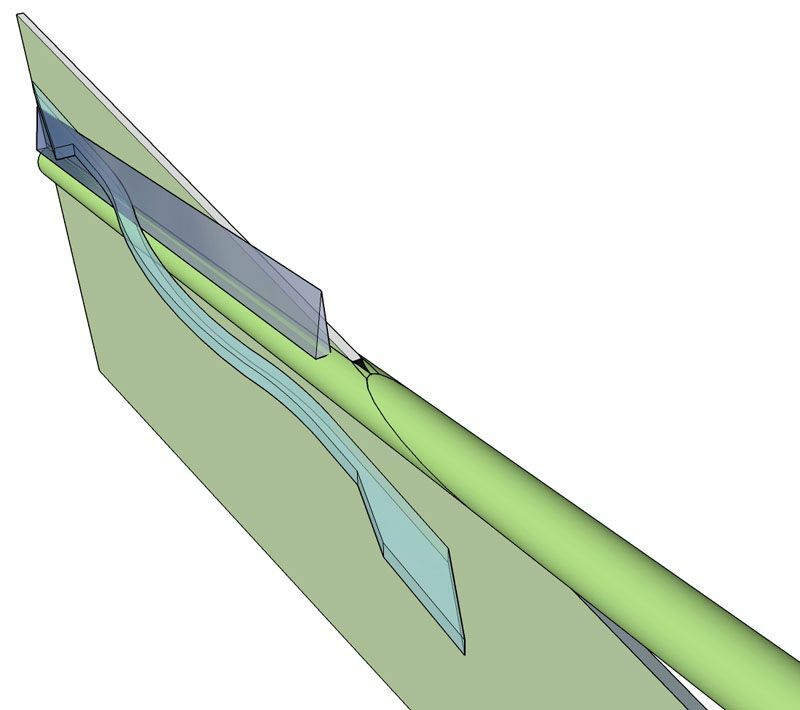 The steeper, bigger tube of faster boats will suffer more than a lower angle of the shaft to the running waterline, of a smaller diameter shaft log traveling at lower speeds. These latter conditions will produce less drag and prop efficiency reduction. If you add a V strut to the stern of a keel to help stabilize an aft bearing the drag goes up substantially, so does the flow to the top of the wheel get more disturbance by design. We talked briefly about keel shoes along the lower edge, the reason was to resist or help straighten curves, or weld heat of contraction variance in the line of the plate keel's lower edge. These too add a pretty high draft depending on their design and installation. I'll take a look at those next, and perhaps a V strut too? Hi Kevin - of course, as I am builing this model, I am extremely interested in all of the explanations, and having your experienced eye go over the possible design choices, or changes, that could improve a beginner's chances of success on a first build. I have halted building (not only to see what you come up with) but the timing is good, as I will be busy in the next few months, with some small projects - getting my docks and sailboat in the water, building a small crane to step the mast myself, instead of paying the marina (raised and lowered it last year without a crane, after tig welding a SS hinge plate to sit below the mast step, and using a gin pole, blocks., etc but feel it is safer in the long run to build a small jib crane and just lift it). I will not make alot of progress over the summer, with boating, fishing, a 2 year old and another one due in Sept. The boat shop is 1 1/2 hours from the cottage, so won't make to many trips - will just enjoy the summer, when not working. I plan to hold off purchasing the hull plate until I have seen what you suggest, and be ready to re-start the building in earnest in the fall, with more practice aluminum welding hours under my belt. It is an understatement to say that your work giving back to the welding/ boatbuilding communities is appreciated, but it really is! Look forward to more as you have time! I'll be discussing, in the next few posts why I advocate for a different shape, and then I'll detail what I think than shape can be. In your case the shape will adapt to the lines shown in the plans easily. 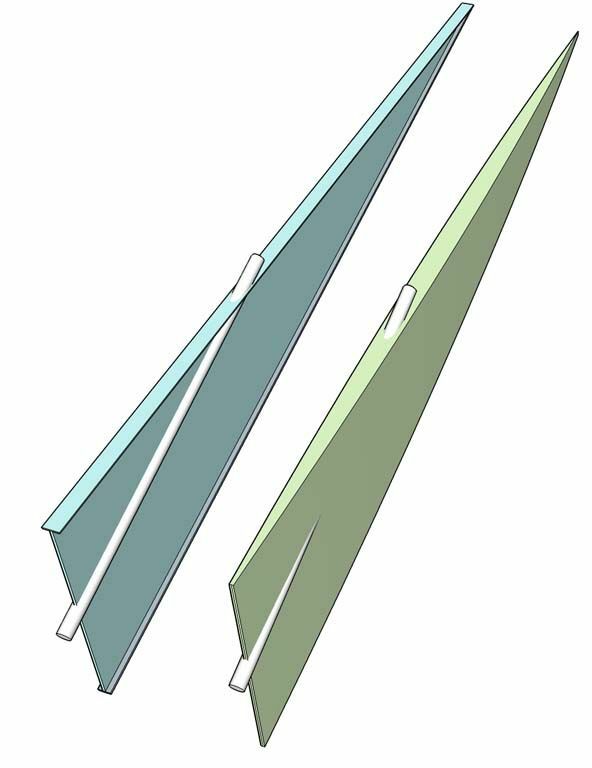 But simply using the original shaft line/prop location combined with potentially different design, you'll be able to consider building with a different keel form. I've done this lots of times including a couple of 40'ers that are still running well, so I'm confident your plans could be, if you chose this method, altered without any harm to your plans package. This thread will end with a fully detailed method of using a 'box' keel structure for inboard aluminum boats. If at the end, there remain questions on your part about applying this method to the Double Eagle, I will then take your plans package pages and create the take-off or dimension drawings so you're able to accomplish the work. As always the discussion, explanations and diagrams are fascinating and throughly understandable...I sure do hope that alloy boat builders are fully aware of all the stuff...amazing! To keep going on the idea of why a box keel may be a better use of metal and result in a lower drag higher strength keel structure under inboard/shaft drive welded boats; we need to mention, at least introduce, the concept of Section Modulus. This term is used when discussing how strong or stiff a beam is. A beam could be a piece of flat sheet metal, a piece of thick plate, or an 'I' or 'H' beam, or it could be a box, and it could be lattice work of a crane boom, they're all potentially beams for the sake of this discussion. We'll skip the math and look at visual explanatoin that will rely more on 'that looks good' but the words mean something so lets get that part out of the way. Next Modulus; in physics which is where we're having this discussion, the word means "How much of some property" . So in our case we're asking how much 'stiffness' or 'how much resistance to bending'. The Section Modulus is a means to compare stiffness as related to the cross section. The plate keel on the left has less cross section than the box on the right. The box on the right is made up of half of the thickness of the heavier plate on the left. The sides are spaced farther apart than the two sides of the plate keel so the Section Modulus is higher- the resistance to bending is greater- the reason is that the right hand box has a greater cross section. Then we can look at the other factor, the water will flow over the box without any surface turbulence when compared to the the tube mounted in the center (at the shaft angle) of the two piece plate. Therefore a box keel is a stronger solution to the keel structure because it can be built of the same amount of metal but spread out to a wider cross section shape is can support more wt without bending easier due to the shape's increased 'section'. AND, the potential for better water flow is easier with a box keel shape. The term box keel doesn't mean I'm advocating pushing a square cornered box through the water, we do need to shape the keel for flow AND stiffness with smoothness all together. Let's get back to the keel shoe not to leave that out. We've discussed the plate versus box for flow and for stiffness, so lets looks at a formed box to see what it may look like in 3D. nearest the viewer is a plate keel with a flat bar shoe to stiffen the lower edge, an a small piece of the hull bottom showing the plate keel as long, thin, or very tall and slender I beam with a small section modulus but still strong. The flow of the water over the flat shoe and the exposed tube are a little more turbulent than the green shaped box keel that is sort of like a fish's fin. Then looking from inside the hull, again, to show the shape of the box keel's bulge over the shaft log penetration at the hull/keel/rabbit line. This is shown in the other views but I want to explain here, this bulge can be much wider than shown and the keel will still be much more 'streamlined' that the plate and bar assembly in blue. The reason to make this point is that the shaft log or stern tube's penetration of the hull is not detailed yet, so the shape comparison images are not to real life scale, they're just approximated to show their relative shapes and imply water flow over the two shapes. The box keel's shoe (leading edge) shape is not shown because it was complicated to draw but a 1/2 pipe, tapered fore and aft will result in a rounded lower edge, further streamlining that form as it moves through the water. This shape reduces drag, increasing clean flow to the wheel, can be welded as a box fabrication and can replace a plate keel on the same plans set without losing any structural integrity or impairing the shaft angle for the original design's wheel and engine geometry. Hope this helps explain more of the reasons why I advocate for the hollow box keel method over the I-beam plate method of assembling a power boats shaft and keel assembly? After looking around old drives back up drives, new drives and unmounted storage, I have found some images that will save me drawing new - for the most part. 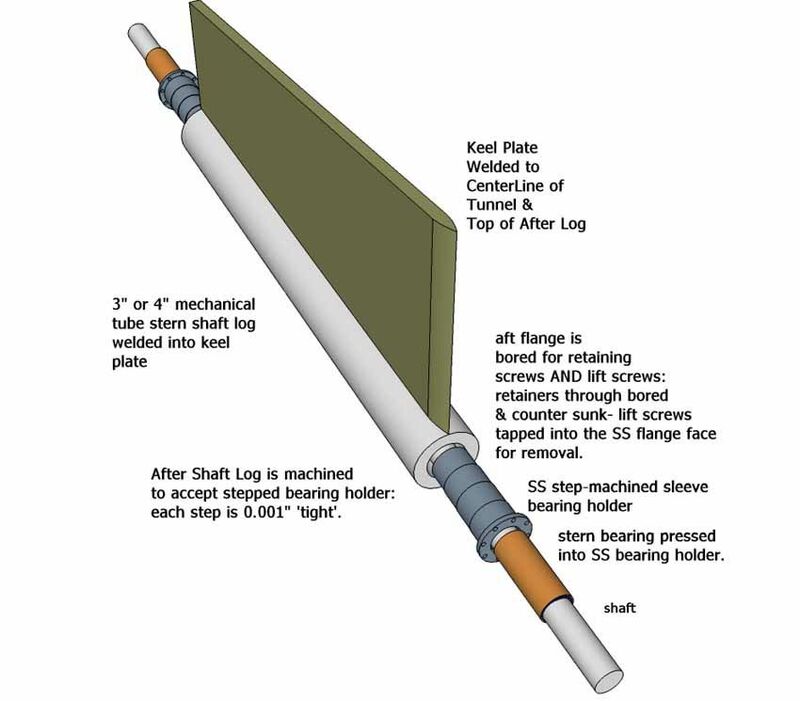 We've been talking about plate keels and box or hollow keels but they both have shaft logs. Here are some images that will help to plan the shaft log. But.. first we need to make some key points. I show a SS machined bearing holder here and that may or MAY not be within your means? They won't be free/cheap/or even inexpensive unless you have resources in this field. Second... an the bigger point is that SS and aluminum DO REACT underwater so if you use this bearing holder you will need to put in some isolation provisions, that are not drawn here, since I was discussing this concept with a machinist/engineer who had his own shop and tools and was well aware of the need to isolate the two metals. 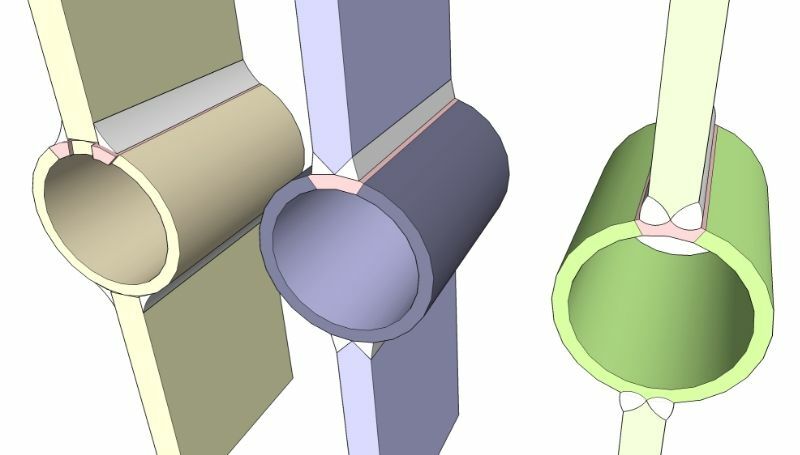 this method of using mechanical tube and the machine shop to line up the bearings, (more than one in this case) and the stuffing box, can be done for most any size shaft by scaling down the dimensions shown. There is no machine section drawing provided, you'll have to do one for your machine shop if you use this method. 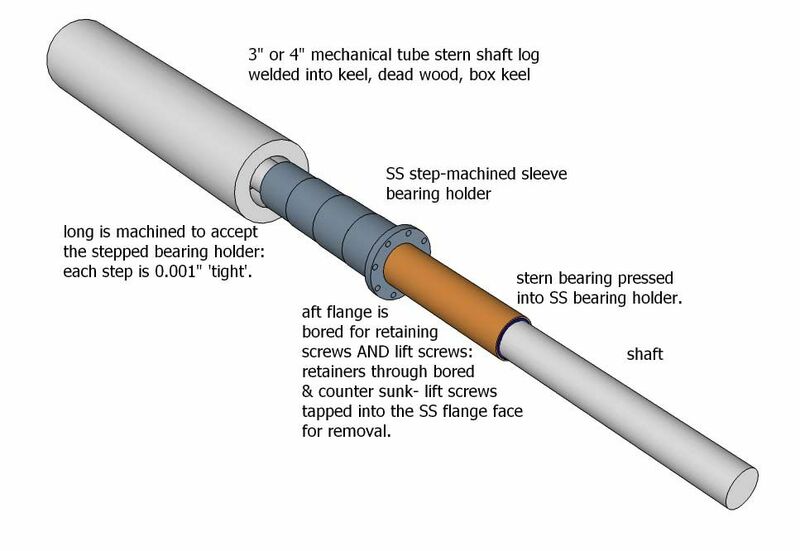 Next isolation; the sleeve or barrel needs to be fit into the aluminum shaft log, and that needs a release/isolation film or coating. That can be done with epoxy, paint the log after it is machined, using an etch, primer and topcoat. OR, the log can be lined with a film of plastic, exact thickness of sheet plastic are readily available to act as a 'thin bushing' material between the shaft log and the bearing holder. LAst but not least the phenolic style bearing can be inserted directly into the shaft log, in a force/press/interference fit and with set screws will stay put. This method is only a pain when you need the old bearing out and have to make bearing puller that will reach inside the log and extract the old cutless bearing using a small lip at its forward edge!!! back to the plate keel idea.... this is how the mechanical tube shaft log would apply there, but .... there are better methods than this. It was in a comparison discussion like we're holding here, so I've included it so we can see the effectiveness of having a machine shop do the bore alignment. This particular boat was a river boat with a tunnel, so the mention in the notes on this image. 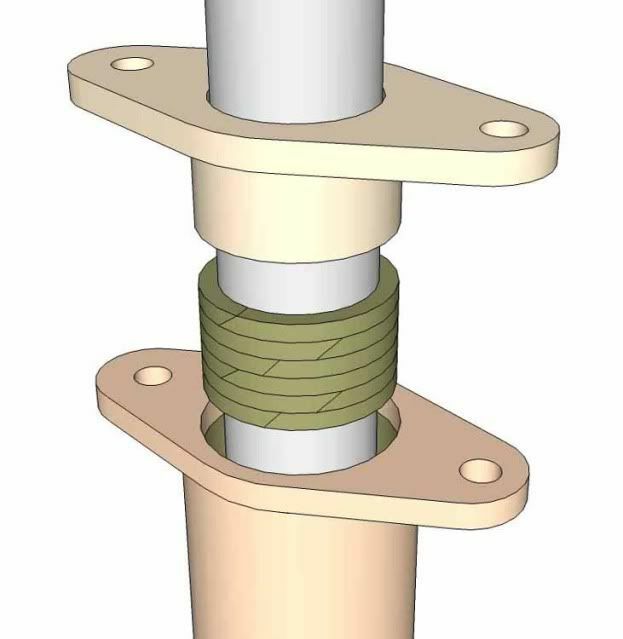 An image explaining how the SS flanged bearing holder works. One set of screws holds the pressed in bearing into the log while another set is used to 'lift' or pull the holder out to take it to the press to replace the worn out cutless. One set of holes in the flange are through bored the other set is tapped, one holds the other lifts the flange (if it has release agent!!!) out. here is where another aspect of isolation and metal galvanic protection should come into the builder's plans. Passivation of the SS. ( http://www.mmsonline.com/articles/how-t ... teel-parts ) This is just a surface treatment to reduce reaction with the aluminum, often ignored or skipped it will help the edges of this SS holder and flange to slow the reaction to the aluminum. Also painting with epoxy paints will reduce the surface interactions at the edges of the flange as well. in the previous discussion with the river boat's tunnel the shaft was long, so there was an intermediate bearing and this just shows the box keel with a 'window' to accommodate access to that bearing. But if the Double Eagle's shaft does not have an intermediate bearing- just skip this. 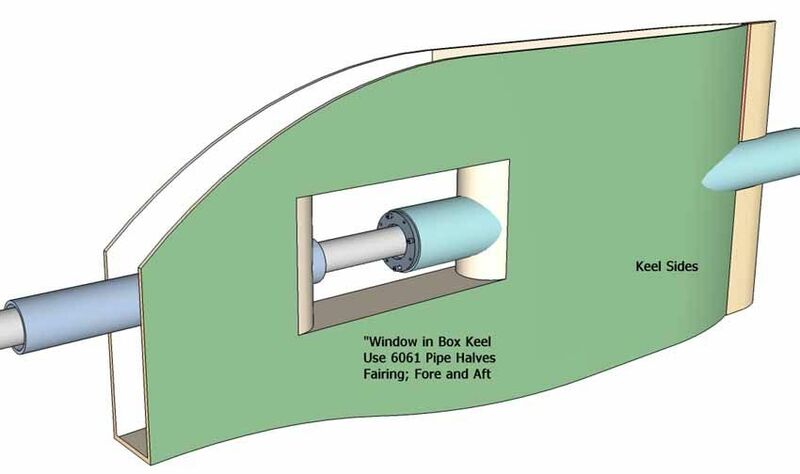 My reason to include it is to show the box keel concept can be pretty wide without near as much drag as a plate and shoe keel. I think I'm getting near the image limit so I'll start another post. The first thing to do is work in the Profile View and get the dimensions of the intended shaft log length and angle, then measure the distance from the keel to the top of the log you chose. This give the layout for the shaft log, once machined. A hole in the hull is taken from the same view and its location with regard the nearest frames can be measured and laid down on the hull, if the hull has a VKB then it will need to be cut for the shaft log. This next image is not a construction sequence image. The reason this is not a construction sequence image is that the orange tapered and rabbited bar is made up first and tacked to hold the tube in the correct angle and location. The lower bar is added using a straight edge like this was going to become a plate keel in the previous posts. The log may be tacked in with a V set of bars to the hull as well. All these pieces need to be used to keep the log exactly where it needs to be, vertically below the keel and at the correct 'plans angel' to the keel or waterline. 3/4" bar is shown here, but in the Double Eagle either 1/2 or 3/8 will work fine. The fore aft distance in the DE can be 3" instead of the bigger longer taper shown here. The orange bar is (becomes) the after keel stem post. This just zooms in to show the weld prep for each piece, TIG is preferred but MIG will work fine. The need to preheat the shaft log is dependent on the power supply's output. If the welder can't produce more than 250A then the log will require preheat and so may the stem post bars. I cut these shapes using a wood router and carbide bits, just set the bit shallow and take two or three passes and use frying pan spray to lube the bit, and lots of PPE! next the fits and how to layout the patterns to do this box keel method. Double Eagle Build: Checking In? North, how is this going? does the idea being presented make sense? I'm not completely finished with the rudder shoe, the keel shoe and the various bearing's fittings but at this point it would be good to see if you have specific questions or if the info is confusing? of course, anyone else reading that has questions is always welcome to post those questions too, I get the feeling like I'm the lone poster here... Admittedly an esoteric topic in that most all welded boats on the forum have legs bolted on, so anyone building keel and shaft boats are likely to be the minority. Please let me know if I need to address specific aspects of this topic that are not clear? Hi Kevin - again terrific images and explanations! I am following your ideas and reasoning fine, and must admit that this is a more adavanced "box" keel than I had envisioned - however, I can imagine that the benefit of less drag is worth having a more sophisticated and streamlined "box" than what I had been thinking about. I had thought that the aft end would be a blunt flat surface, perhaps 3-4" wide (similar to the images in your post 11), and that the shaft tube woud just exit from that flat plane, through a hole, and of course be welded all around the hole. As I had this simple model in mind, I thought the shaft tube could really be aligned and put in after the keel was built, exiting at the proper angle. I assume now that the drag or other negative attributes of a simple flat aft surface means that it is worth following your advice through, and realizing the benefit of a better designed keel. My power source goes up to 300 amps on single phase, but I will likely seek out the help of the local welder, when it comes to tacking larger and more important pieces. I appreicate all of your work in arranging and explaining the topics! Both the power shaft and the rudder shaft penetrate the hull in this design of boat, in an outboard that's all self-contained and we don't have to build or do 'anything'. Bolt on the leg, attach the power steering cables and cylinder and you're good to go. Not so with the older types of inboard drive. The shaft WERE IN THE PAST, sealed by a set of devices called 'stuffing boxes' for the fact that actual hemp rope was 'stuffed in' and compressed by the 'box' and that rope around the shaft was squeezed so tight, the water stayed in the ocean not the bilges. But that is not the only method of sealing shafts today. We're not going to deal with graphite dripless shaft seals in this post. I'm going to introduce, for the historically interested, the 'old school' way to seal a turning shaft from leaking water, except for a few planned for drops! Here it is, in a simplified form; the invention that allowed steam and all subsequent power boats' shafts to seal: the Stuffing Box. This image is a sort of simplified version that would work fine on the D'Eagle and will work as an illustration of what would seal the power shaft AND the rudder's shaft. This box is expanded to the elemental parts, the lower housing is just a bit larger in bore than the upper flanges extended compression land or plunger. That allows the upper (SAE 2 Bolt flange shown for simplicity) flange to push down inside the lower housing. Notice the 'green rings'- that is hemp or 'rope' which is going to be compressed downward by they force of the flange's plunger pushing down into the 'box'. Please look closely at the lower edge of the upper flange's plunger's lower lip- its not flat. Instead the lower edge is concave to as it pushes down on the ropes of 'packing' they're also allowed to bulge inward toward the shaft. The two compression bolts at the edges of the stuffing box are not shown. getting in closer the flange's plunger is tapered inward in a cone so the packing ropes, when compressed bulge inward putting force on the shaft sealing it from water coming up the rudder stock or the the power shaft, when sufficient pressure in clamped on the upper flange by the two side compression bolts that we all know are not shown. 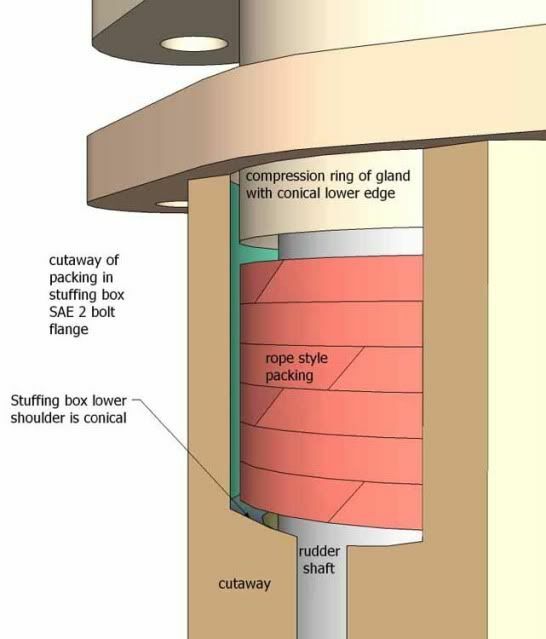 This should show the idea of a stuffing box. The rings of rope packing are compressed in a close fitting cylinder so the compression force bulges out and wipes the power or rudder shaft tightly enough that it moves without leaking water into the bilge even if the shaft is 'free to turn'. Yes, there are maintenance issues, and (yes) these are not the highest tech methods of shaft sealing. Yes, they can dry out, yes repacking is a pain in the stern and yes a nice lip seal roller bearing on the bottom shaft of an outboard is eons more advanced and trouble free. But... all is not lost. There is a way to upgrade this simple design so it becomes many years between service and is super reliable at the same time. Ad grease. Yep its as simple as adding grease, but not all greased stuffing boxes are created equal, and mine is the best. Grease pumped into the outside cylinder of the rope or packing chamber will not reliably get to the inside of the rope to shaft surface and that's where it does its magic of adding long life with lowered flange pressure and increased sealing without shaft wear. 'ole Kev's Grease ring; this plastic ring can be machined or even cut from plastic tubing of the right sized and sanded to the OD/ID needed. The idea is simple. 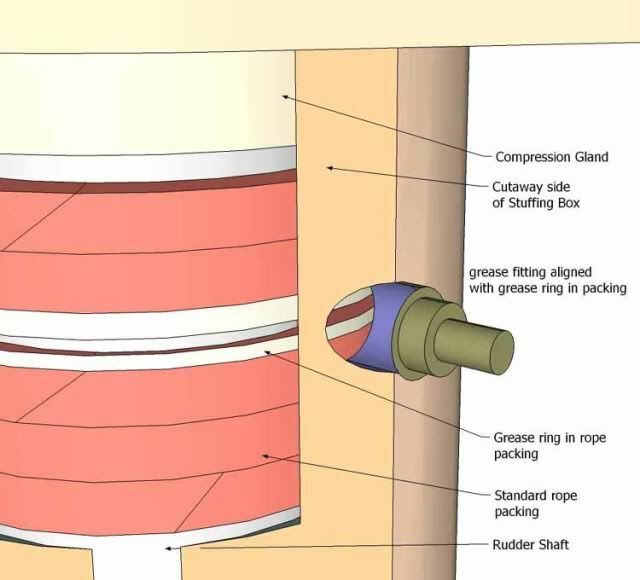 Allow a grease fitting outside the stuffing box to fill the backing groove with grease and it will flow through the holes into the interior of the shaft surface at the center of the packing. and that my friends makes a fine, easily serviced, totally reliable, non-wearing shaft seal usually much lower in cost than a 'dripless seal'. In this stack of packing rope is a grease ring allowing the grease to flow into the shaft interface, this will mean the actual rope to metal surface is greased and this is a very long lasting change to traditional stuffing boxes. Of course you can spend the National Debt and get a wonderful graphite faced, water injected, dripless shaft seal- but this will do the job as well for a whole lot less money and it can't ever fail and come apart. There's nothing to fail. 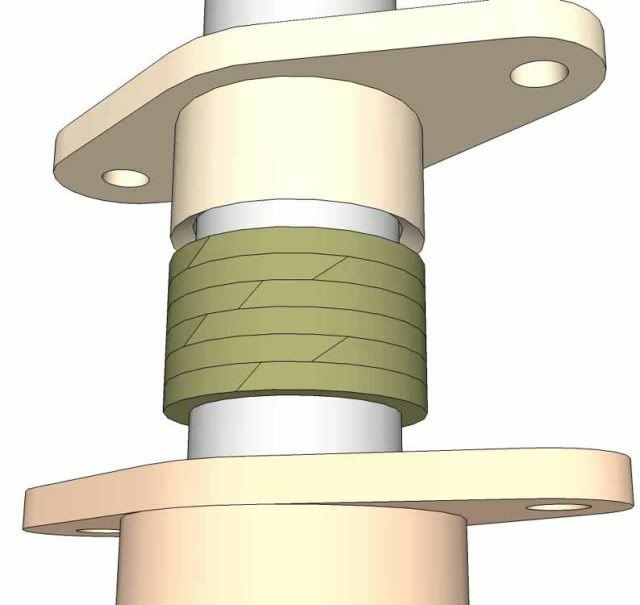 The reason we're looking at stuffing boxes is because we're going to have to account for shaft seals in the keel design, and the rudder design and we're not even back to the rudder yet, so I'm just introducing the concept and mentioning that this technology will work is likely cheaper than a shaft seal (?) don't know; and is important for any boat builder to know anyway!!! tap, tap, tap, testing; one two three -is this thing on???? Yes We're paying attention. Don't stop. On a keel cooled boat you really can use a dripless because you usually don't have a water source. Welderbob, in an inboard w/ shaft boat-the log is flooded to the stuffing box so that is where this type of seal gets lubed (not counting the grease that is combined with the water). I mean the waterline is generally above the level of the stuffing box so the back of the packing is wet? In my experience the packing is essentially lubed by the water flooding the shaft log? I may not get the drift of your remarks? I'll try to get some more drawing done to make more sense of my scattered presentation of this method of building. Sorry Kevin ,I should have explained more. On the few keel cooled engine I' ve installed there is no saltwater side to the cooling system. Since is no "raw" water pump to feed a heat exchanger, there would be no place to get that little bit of water/pressure to feed the face of the mechanical seal. Bob, I have to plead ignorance, I have only seen tubes that lead from the shaft log to the seal face- not fully pressurized water feed? The log has a very small pressure due to the shaft movement and the 'cyclone pump' of the shaft movement. The tubes I've seen were sourced at a tap on the log, inside the engine rooms, and lead to the moving part of the face seal's clamp-on housing. I'm not familiar with these seals as they came to market just after I quit building fulltime in about 1988 or so. They work well, they're very nice technology but in this post I'm stressing the 'old stand-by' methods to make references for the keel and shaft builders of Glen-L's Double Eagle. I'll have to make time to research the new seals and learn enough not to be embarrassing about their various functions..
Kevin- Lots of other stuff on the go now, but still very interested in this topic, and what you have in-store for details. I am familiar with the old-style stuffing boxes- have one in my 1978 30' sailboat. Repacked it last time with Gore-tex or very similar packing and it works very well - almost dry yet stays cool - a big advance, IMHO, over the traditional packing. I stayed away from the also newer Teflon ( I believe) type that I had read bad reviews on at the time. North, we're getting into some very narrow details here! Packing (rope stuffing) is not used by 99% of the AAB.com('s) members or readers so discussing the various impregnation materials of rope packing is going to get the topic some serious readership! Whether the rope/packing/fibrous sealant rings are impregnated/saturated with animal grease (old school) or modern chemical concoctions the traditional 'stuffing box' does work, and they all work better if you install a grease ring and add some (impregnation compound) compatible grease to make a 'shear sealant' of the grease and rope on the metal shaft. I'd heard or read praise and complaint for every type of rope and almost all the chemicals used to make the face of the stuffing rings more 'slick' while still sealing. I've used several types but would have to go back to skippers I haven't visited in decades to get any kind of consensus of what was the 'best'. I'm back to work doing illustrations online so I'm not planning to spend lots of time on the new illustrations needed to move this topic along. I do plan to show the basic construction methods I've used, but since that was before anyone bothered to keep a camera in the shop- I'll have to illustrate these ideas and sequence. I do plan to show the keel construction, with the shaft log, and to show some ideas for the rudder pintle bearing and the pintle shoe, extending off the aft lower end of the keel, this is important here where logs float below the surface and rocks are mostly charted. I'll even have some rudder remarks to show, but not until I get a few paying illustrations done. 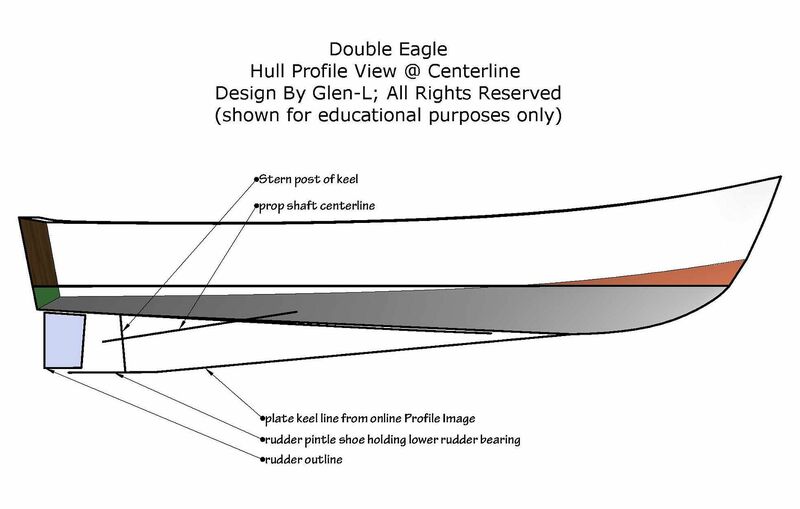 When the season's winding down & Wwhen.... you're ready to get back in the shop, post up and we'll resume this thread's updates on an alternative design for the Glen-L Designed D'Eagle keel construction if that is still work in your future? Yes, still very much in plans for this late fall / winter. Just had our 2nd baby, healthy little girl, last week, so a bit crazy here at the house now. I plan to correct my previous mistakes and finish up the stringers in the Oct / Nov timeframe and order the hull sheet about that time. I would like to start to get a good understanding by then, about the modifications, so I don't put the cart before the horse, and so I can order the appropriate sheet / plate for the keel - depending on thickness. I am planning, tentatively, on using 3/16" 5086 for the hull bottom, topsides and cockpit sole as opposed to the 1/8" on plans (remembering I stretched the boat from 23' to 25' as allowable in plans). I bought a 4" x 8" sheet of 3/8" for the old style keel, but now will need to know what thickness to buy for the new keel design - I assume it may be thinner as it will be supported better than the single plate design? ?